So you’re interested in remodeling your bathroom and don’t know quite where to start. Bathroom remodeling can be as simple as a updating the tile & backsplash or as complicated as a complete renovation. Here at Sky Renovation, no matter what the scale of your bathroom remodel, we can get the work done in just 10 days. And we are the Los Angeles contracting company that can guide you through every step of the process, helping you choose the materials and style that will help us build you the bathroom of your dreams. 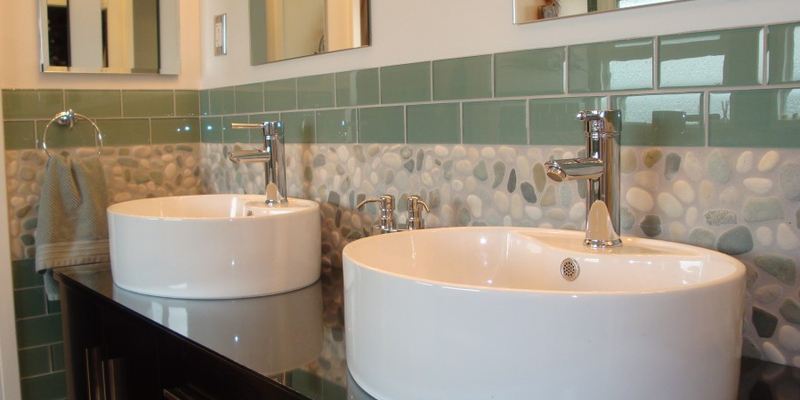 The process usually begins with selecting the basic elements of your new bathroom: the tiles and the backsplash. Your choices will be guided by the paint you choose for your bathroom, the areas you want to tile (there are numerous possibilities beyond flooring), the fixtures you install, and the overall style of your remodeled bathroom. Ceramic mosaic tiles can provide grip on potentially slippery surfaces, such as in or around your shower. Glass tiles, on the other hand, can look great on walls when laid over the perfect color paint. Natural stone tiles can give your bathroom an earthy look, and carry the added benefit of being extremely durable. If you are unsure of the exact style you want, our seasoned design experts can help you pick out the tiles that will form the foundation for your entire bathroom. Choosing your backsplash is not always separate from choosing your tiles. As a matter of fact, the two are intricately related, even if they don’t exactly match. It just depends on the look you’re going for. Backsplashes are a must-have feature in your bathroom; they protect your walls from the moisture that comes from your sink. Without a backsplash, the paint or wallpaper on that part of the wall wears down a lot faster than the surrounding areas, and that never looks good. Neutral mosaic tiles are a great way to add character to any wall in your bathroom, including the backsplash are. They look especially good in ultra-modern bathrooms with clean lines and solid colors. Another look that works well in modern bathrooms is the glass backsplash. Despite being the exact opposite of mosaics, a solid piece of clear glass also looks great with clean lines and solid colors. Try this style over a pale blue for a look that’s subtle and sharp. These are just a couple of backsplash style that can give your bathroom unique character and complement the other décor elements.To find out more about all the backsplash and tile options available to you, contact us today. Our professional contractors can help you come up with a bathroom redesign that looks great and makes the rest of your home shine. REMODEL YOUR BATH IN 10 DAYS!